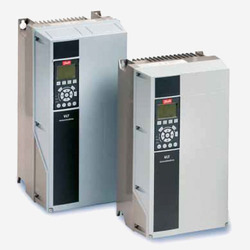 Danfoss VLT Automation Drive FC 301 / FC 302, The VLT® Automation Drive is designed for variable speed control of all asynchronous motors and permanent magnet motors. It comes in a standard version (FC 301) and an advanced high dynamic version (FC 302) with additional functionalities. It helps save energy, increase flexibility, reduce costs related to spare parts and servicing, and optimize process control on any industrial machine or production line. The VLT Automation Drive is built on a flexible, modular design concept to provide versatile control. Its robust construction ensures maximum uptime. It comes equipped with a wide range of standard industry features which can be expanded with ‘plug-and-play’ options. The user-friendly graphical control panel ensures the drive is easy to set up and operate saving commissioning and operating costs. Enclosures are available up to IP 66 (depending on the model). Integrated DC chokes and RFI filters in all models protect installations by minimizing harmonic distortion and electromagnetic interference. The VLT Automation Drive can also be used with applications that need to perform high-precision positioning and synchronization operations. The Integrated Motion Controller (IMC) functionality is now configurable in the drive’s software. No additional modules or hardware are necessary. All drives are fully tested already at the factory. They require very little maintenance and provide a fast return on investment. 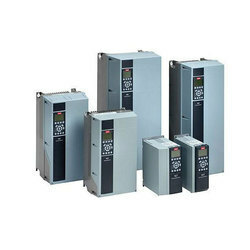 Danfoss VLT Automation Drive FC 360, The VLT® Automation Drive FC 360 is a compact, space-saving, general-purpose AC drive available in 5 frame sizes. Designed with ease-of-use, reliability and flexibility in mind, the basic, yet comprehensive features provide precise and energy-efficient motor control for a wide range of industrial applications. 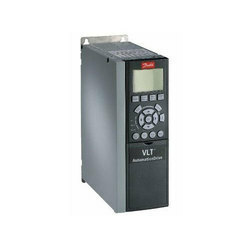 The VLT® Automation Drive is designed to perform reliably in harsh environments. The coated PCB reduces dust, moisture and particle issues and the maximum operating temperature is 55C. Built-in features, such as PID controller, EMC filter, DC choke and brake chopper to 22 kW, save costs and installation space. IP 20 protection, a removable fan and an enhanced numerical display ensure fast setup and simpler maintenance. Danfoss Aqua Drive FC 202, The VLT® AQUA Drive is designed to provide the highest level of performance of AC-motor-driven water and wastewater applications. Featuring a wide range of powerful standard features, which can be expanded with performance-improving options, the drive is equally suited to both new and retrofit projects. The considerable daily load variation in water or wastewater treatment plants makes it economically feasible to introduce motor control on rotating equipment such as pumps and blowers. The new generation VLT AQUA Drive can realistically offer first-year cost savings of between 10–30% compared to traditional drive solutions. Its high lifetime availability and low energy consumption and maintenance costs provide you with the lowest cost of ownership. The quick and user-friendly setup of water and pump settings reduces installation time ensuring a fast route to maximum energy efficiency and motor control. By collecting the most important parameters in one place, the risk of incorrect configuration is reduced significantly. Centrifugal pumps and blowers, positive displacement blowers.